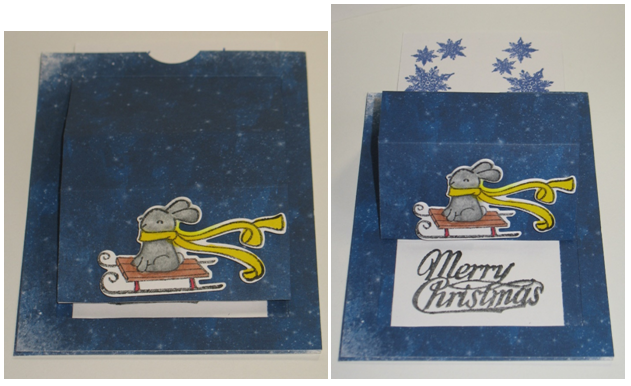 Slide into the fun of this season or any time of year with this cute slider card design. It opens up to reveal a special message that will leave anyone smiling. It’s an interactive card that’s really easy to make! 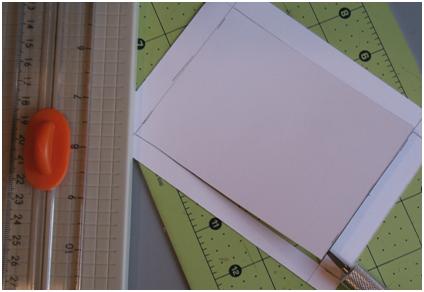 Begin by cutting 2 rectangles that measure 4 ¼” 5 1 /2” from patterned paper (Whiteout by Bo Bunny shown) using a paper trimmer and lay one of them aside. Turn the other one over and measure ½” on every side. Put the rectangle into the paper trimmer (or you can use a craft knife and self-healing mat) lining it up with first ½” line on the left and cut it. Repeat the cut on the right hand side and then across the bottom making sure to only cut between the first two lines cut. 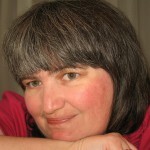 Do not cut all the way to the edges and do not cut the top line. Place the piece on a scoring board with the uncut line on the left and score it on the ½” line (the one that was not cut) between the cut lines only. Move across to the 2 ¼” line on the score board and score there. At this point, if you want a large section to the easel do not score again, but if you want an smaller section as is on this card which supports a smaller image score one last time at the 3 ¼” line. Lay this piece aside. 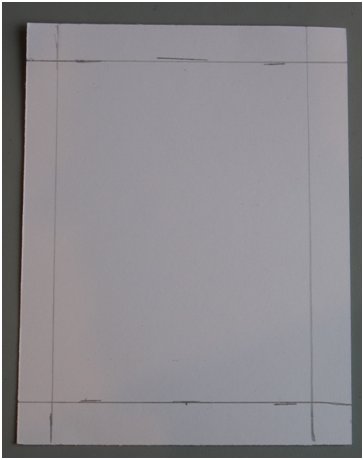 Now cut a third rectangle that measures 3 ¼” x 5 ½” from cardstock. Measure ½” from the side and score there. Fold the newly created flap upwards. This will be the slider piece of the card. Hold both rectangles together so that they are line up and punch a half circle using a circle punch from the center of the back edge. 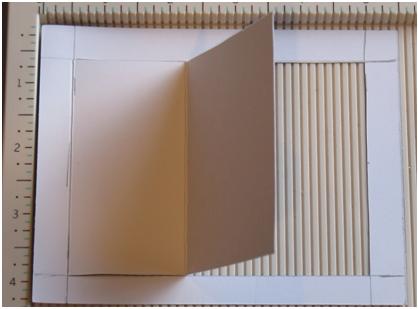 Attach the flap of the slider piece to the back of the flap that was created on the patterned paper rectangle with a tape runner. It will be attached at the end that has been cut, not the scored one. 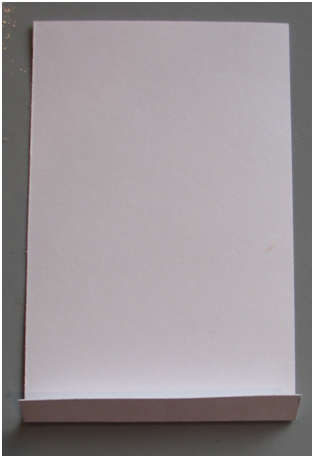 Stamp the message onto a 2” x 2 ¾” piece of cardstock and attach it to the base of the card making sure that it is lined up with the opening on the slider piece. Tape the finished slider rectangle on top of this piece making sure the edges of the papers are lined up. Stamp and die cut (Winter Bunny by Lawn Fawn shown) the image out. You will need a die cutting machine to do this step. Color the image with markers, colored pencils or paints and attach it to the slider using a 3-d adhesive to make it stand out from the base. 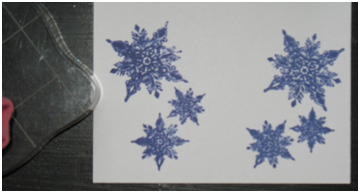 Pull the slider out and stamp snowflakes onto it using a blue ink. Slide into the holidays or any occasion with this cute slider card. Add to the excitement with a special hidden message that is revealed when it is opened. This card can be designed to fit any occasion where you need a little fun. 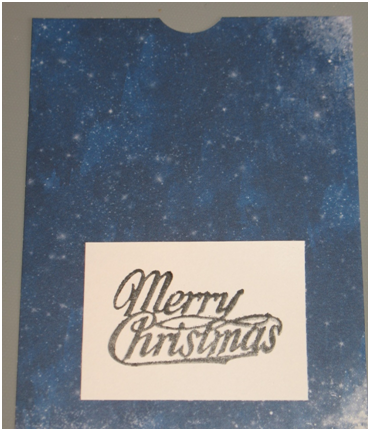 This entry was posted in Cardmaking, Christmas, Holidays & Seasons, Rubber Stamping and tagged Craft Techniques, Die Cutting on December 23, 2015 by Peg.